The word “tundra” is tossed around casually to describe cold areas in the world, but there’s nothing casual about the 2016 Toyota Tundra. This truck is business on the outside and luxury on the inside, because you want to feel comfortable while you’re hauling around big loads while dominating the terrain. The 2016 Toyota Tundra is available at Attrell Toyota in Brampton ON and it’s the ideal vehicle if you work with large loads – or if you like being that friend who helps when the others move – and it works in all conditions. Plus, we all know that it doesn’t get much colder than Canada’s weather, so what better vehicle is there for the frosty tundra than the vehicle named after the conditions itself? Since you can fit up to six comfortably inside in double bed models, feel free to bring along witnesses. The Tundra name has been popular for years, and that’s because you can rely upon the truck’s craftsmanship, reliability, and brute strength. The 2016 Toyota Tundra is no exception. Want power? The truck can tow up to 4,760 kg (10,500 pounds), which is more than five tons. Want versatility? With a 2.5-meter-long truck bed in the regular cab models and 1.8-meter bed for the double cab models, the Tundra can fit darn near anything. And if you want tools to make sure your large load stays put, the Toyota Tundra comes with four tie-down cleats. If you want to put something over your cargo, the sturdy tri-fold tonneau cover will keep your valuables safe. 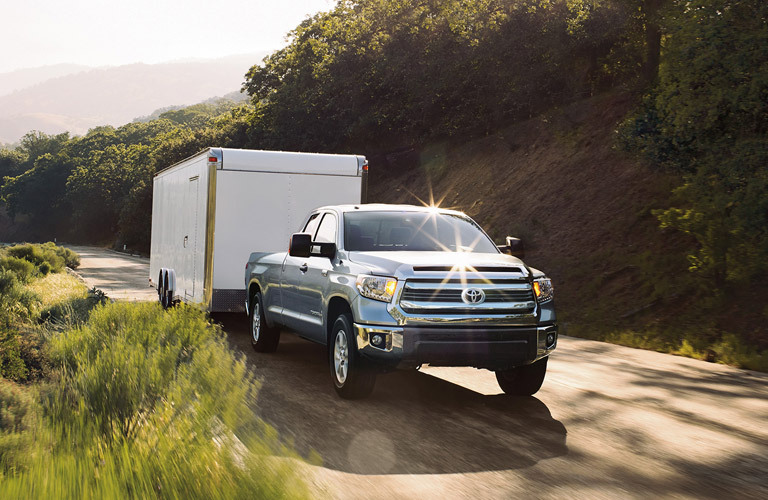 It doesn’t matter if you drive the Tundra through the streets of Toronto or the wilds of greater Ontario, you’re going to keep your loads safe and you’re going to feel power, up to 381 horsepower in the regular cab models. If you’re looking for superior security, the Tundra comes with the Toyota Star Safety System, which includes features like Smart Stop Technology (SST), Anti-lock Brake System (ABS), and Traction Control (TRAC). Attrell Toyota is located at 110 Canam Crescent, Brampton, Ontario, L7A 1A9, and we have plenty of Tundras as well as other models in stock. We serve the greater Mississauga and Toronto area as well. Please contact us at 905-451-7235 or come visit us today to see our cars or to take one for a test drive.